Amazon Price: $14.98 (as of February 12, 2019 1:03 pm - Details). Product prices and availability are accurate as of the date/time indicated and are subject to change. Any price and availability information displayed on the Amazon site at the time of purchase will apply to the purchase of this product. 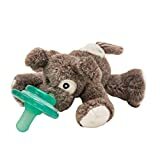 If you have a pacifier loving baby you've probably been through the painful experience of frantically searching for your baby's pacifier while your little love screams out in desperation for their lost soother. Search no more, there's a better way! Eliminate the stress of searching for lost pacifiers with our universal pacifier holder. Paci-Plushies Pacifier Holders keep the pacifier close to baby making it easier for babies to grasp onto and independently maneuver the pacifier. Paci-Plushies® have a flexible Hug Ring that attaches to a variety of baby's favorite pacifiers. This unique feature gives baby the ability to choose their preferred pacifier and parents the ability to replace and sanitize the pacifier when necessary. When baby outgrows the pacifier, the Paci-Plushies animal becomes a familiar toy that helps ease the transition. Turn any Paci-Plushies plush product into a Teether with our Chillies Teether Add-On. These lightweight chillables help to soothe tender gums and boo-boos for children of all ages. Attach your favorite Paci-Plushie and baby will enjoy the cooling power of a teether while keeping their fingers warm with their favorite plush. Paci-Plushies are compatible with most but not all pacifiers. Gumdrop, Dr Brown Orthees and other pacifiers without a shield will not attach securely. Soothie pacifiers can be attached but may not be suitable for all ages as the pacifier can easily be removed. Paci-Plushies work best with pacifiers that have a button or ring shield. Compatible with the following and more: Philips Avent Freeflow, Philips AVENT Night Time, Dr. Brown's PreVent, MAM Mini-Air Orthodontic, MAM Orthodontic, MAM Newborn Start Orthodontic, NUK Silicone, NUK Advanced Orthodontic, NIP Personalized Pacifier, Playtex Ortho Pro Latex, Playtex Ortho Pro Silicone, Ulubulu Expression, Nuby Classic Oval, Nuby Orthodontic, RazBaby Keep-It-Kleen, BooginHead. Baby Pacifier Shop is a participant in the Amazon Services LLC Associates Program, an affiliate advertising program designed to provide a means for sites to earn advertising fees by advertising and linking to Amazon.com, Endless.com, MYHABIT.com, SmallParts.com, or AmazonWireless.com. Amazon, the Amazon logo, AmazonSupply, and the AmazonSupply logo are trademarks of Amazon.com, Inc. or its affiliates.